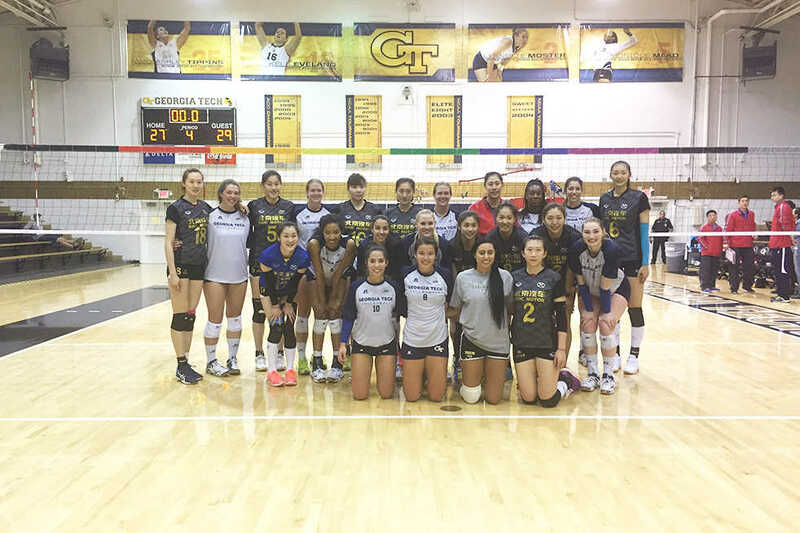 On April 11, the Tech Women’s Volleyball team played host to the Beijing Automobile Works Women’s Volleyball Club (BAW). The teams ate meals together before and after the match, and BAW took a tour of campus prior to the match. The result of the match was 3-1 in favor of BAW, but beyond that, the match signified the growing role of college athletics on an international scale. Tech sports are currently in a renaissance of sorts in terms of international events. This past Fall Tech opened the season against Boston College in Dublin, Ireland. It marked the first time that the team traveled outside of the United States to play a game. Furthermore, the Tech Men’s Basketball team will be traveling to Shanghai, China to open its season this coming Fall against the highly-touted UCLA Bruins. The history of American collegiate athletics beyond the United States’ borders is rich and deeper than most would think. The first college football game played outside of the United States or Canada was played on January 1, 1909 when the Cuban Athletic Club beat Tulane 11-0. That game began a long streak of games being played in Cuba and Canada until 1946. Following that year, only one game was played outside of the United States until 1976, when Texas A&I (now Texas A&M Kingsville) played Henderson State in a string of games across Europe, courtesy of cfbdatawarehouse.com. The cycle of international play continued just as before, with a 10-year drought of international games coming after 1996. Furthermore, a game wasn’t played outside of the U.S. or Canada until 2011, but now it seems the NCAA is back to pushing international games. However, this time these games seem to be about more than just playing, at least in the case of Tech athletics. When Tech travelled to Ireland in the fall, they brought along a delegation of representatives of both the university and the city of Atlanta. President Bud Peterson and Mayor Kasim Reed both traveled to market Tech and Atlanta as growing hubs for business and ideas. On September 1, two days before the game, Trinity College of Dublin hosted a joint faculty symposium. The following morning, foreign direct investment agency IDA Ireland hosted a business breakfast to discuss how U.S. companies had made Ireland their home in recent years, courtesy of gtri.gatech.edu. Taken out of context, this volleyball match seems like a tiny blip on the radar; however, it is very clear that Tech is using athletics as an avenue of marketing the Institute on an international scale. The match against BAW is the perfect stepping stone towards Tech men’s basketball’s game against UCLA coming up this fall; both have the potential to make Tech even more a household name abroad. The game and events surrounding it will most likely mirror the trip to Ireland, with symposia and workshops being a part of the itinerary. However, this game is also result of the Pac-12’s effort in recent years to market its universities on an international scale. The game is officially known as the 2017 Pac-12 China Game presented by the Alibaba Group. This event officially began last year when Stanford played Harvard in Men’s Basketball last year, but the organizer, Pac-12 Global, was founded in 2011. This game marks a perfect storm for both the Pac-12 and Tech; both groups have made a great effort in the past few years to market themselves internationally. While it isn’t clear if Kasim Reed or other delegates for Atlanta will be traveling to China like they did Ireland, President Peterson and new athletic director Todd Stansbury will be there for the Jackets, a chance for Tech to showcase itself once again.